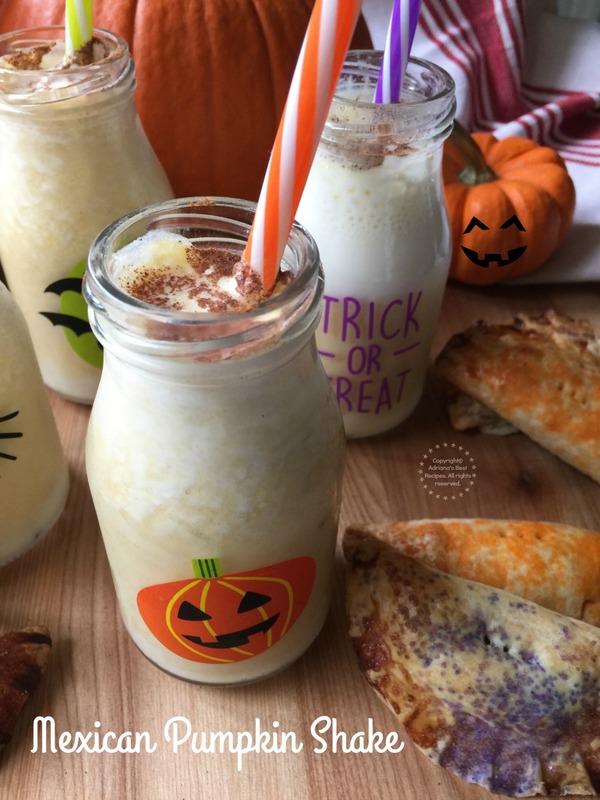 A Tasty Mexican Pumpkin Shake to Cheer with all the Family! 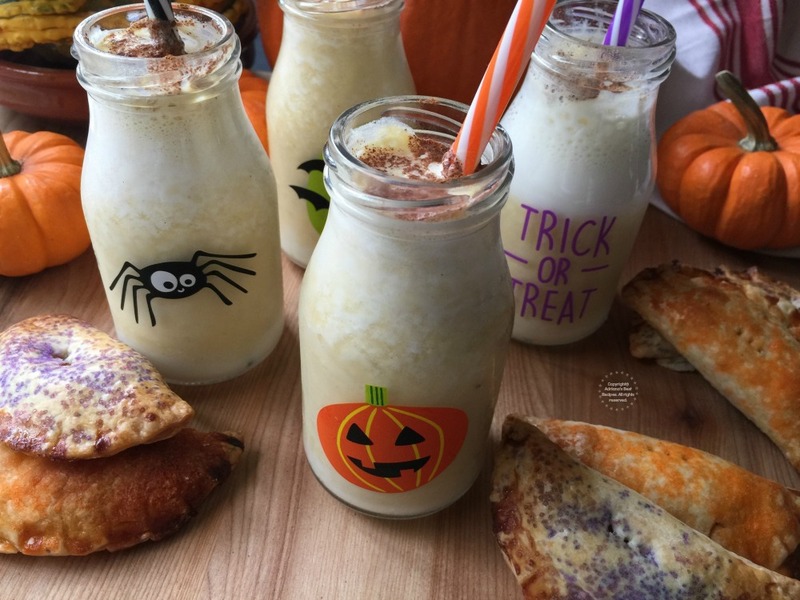 Being the Halloween season why not making a ghoulish Mexican Pumpkin Shake to share with all the family. While growing up at home we were used to eat candied pumpkin with milk. Inspired on that thought I have created a Mexican Pumpkin Shake for Halloween. 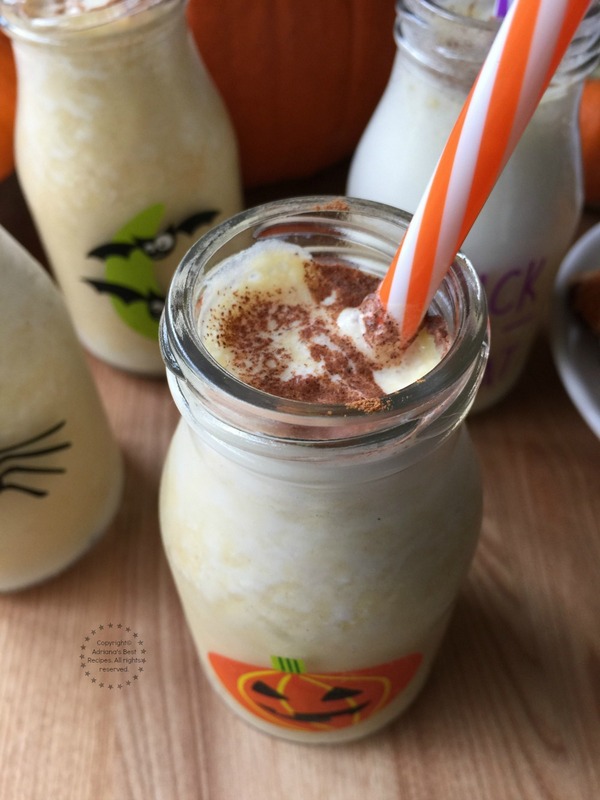 A Tasty Mexican Pumpkin Shake made with candied pumpkin and milk. Very easy treat to serve this Halloween. Place all the ingredients in the blender and blend until getting a smoothie consistency. Serve and garnish with cinnamon. This shake has milk and freshly made calabaza en tacha that I made using my great grandmother’s original recipe. 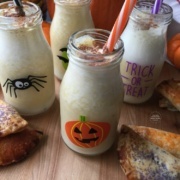 This pumpkin shake is very easy to make. You just have to scoop few spoons of the candied pumpkin and use some of the syrup combined with the milk, blend and voila a delicious drink that is not only nutritious but fun and tasty. I have learned via my grandson that kids sometimes eat with their eyes, so purchasing fun glasses and having colorful straws can entice the kids to try a new kind of shake besides the traditional chocolate milk. 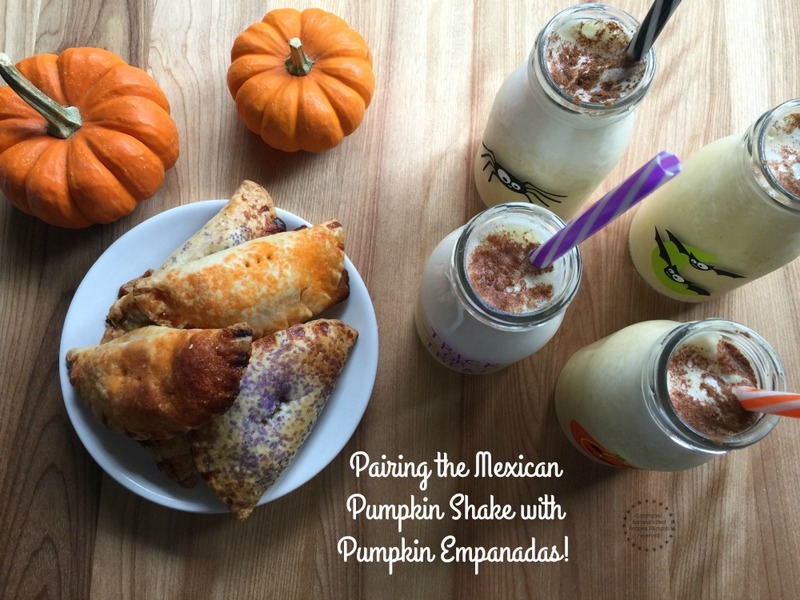 And this Mexican Pumpkin Shake for Halloween is perfect to serve as a snack paired with pumpkin empanadas. My most recent recipe at Produce for Kids. Click on the image to learn how to make this delightful empanadas at home. Milk is such an important protein. Providing our kids a balanced nutrition will allow for them to grow strong and happy. In life it is all about balance and being mindful of what we eat and how much we eat. Having easy snacks made at home with seasonal ingredients can help fulfill the need for the sweet tooth without over doing it. Specially this time of the year when there so much candy offerings. I am not against candy eating but all with moderation. We cannot take away that fun experience of Trick or Treat during Halloween. It is part of childhood memories we create with them. 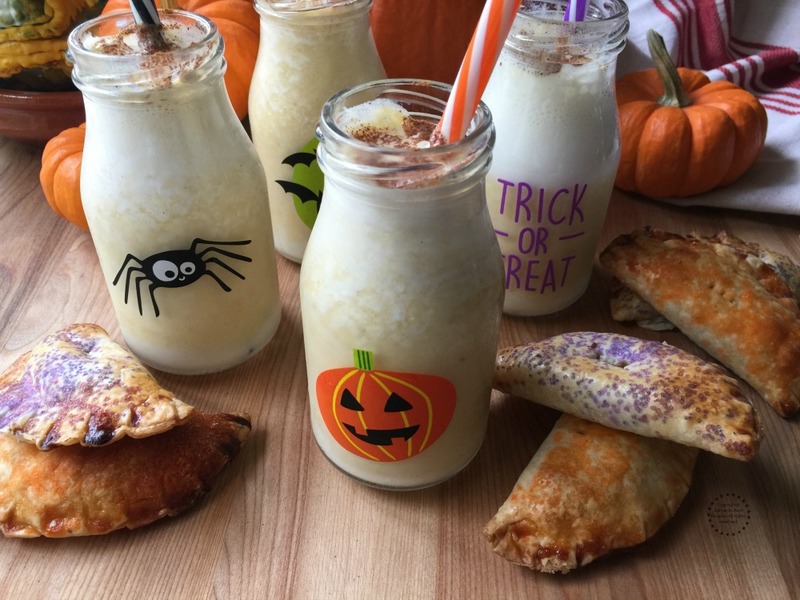 I hope you have enjoyed this new recipe idea for making the Mexican Pumpkin Shake for Halloween, it is good and satisfying. Shakes are my favorite, and this one is nice and simple to make. I don’t believe I have ever had a pumpkin shake. Sounds so delicious and festive! This sounds great! I would never have thought to make a pumpkin shake! It is a childhood favorite, satisfying to manage the sweet tooth cravings too. Sounds delicious. I was looking up recipes for leftover pumpkin pie and saw Pumpkin shakes using ice-cream as well. I hear you the downside of those recipes is that are very high in calories and fat. This recipe I am proposing uses fewer calories because it is made only with homemade pumpkin puree and 2% milk. Much less indulgent than a pumpkin pied shake or ice cream. But with great flavor. I love all things pumpkin so this is right up my alley! I have been on a shake kick too lately! I blame the baby! I absolutely love the ideas of using these adorable milk jug glasses! I think it adds a lot to even making us adults want it! It doesn’t hurt that there is something so tasty in there too! This looks like such a delicious recipe especially for those who are in warmer climates. ”Tis the season of all this pumpkin!!! This shake sounds absolutely delicious. I will have to give it a try! I love shakes on any occasion but these look really good. I love that they are pumpkin flavored and seem to have such a rich flavor. Did you make those cute shake glasses? Or is there somewhere you bought them? I love how festive they are! This sounds so good! I love the idea of pairing these with some delicious pumpkin empanadas. This sounds delicious! Using your grandma’s recipe for calabaza en tacha as a base is wonderful! Grandma’s always know best! My 10-year-old was just asking if we could get milkshakes soon! I think we are going to make these instead – sounds delish and perfect for this time of the year! I bet this is super yummy. I love that it’s so simple. OH cinnamon and pumpkin together!! This is perfect fall weather drinks. I love that you added candied pumpkin – I use to love it but I don’t get it here! Will look for it. Simple but so delicious! Love the sound of this iced pumpkin drink! This sounds SO delicious! Love pumpkin everything, and love that you added cinnamon to it. My family would love this treat!